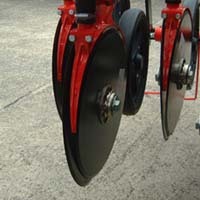 Low disturbance double disc coulters with close coupled press wheels for optimum seed placement. The leading disc design allows the coulter to cut through the soil surface and crop residues while minimizing the risk of "hair pinning" and trapping stones between the disc's. Maintenance free, slimline hubs provide maximum clearance between coulter units to prevent blockages in min-till situations. The shallow angle of the disc's reduces the amount of soil being moved for minimum disturbance drilling, this reduces the power requirement of the tractor and ensures seeds are always covered, deeper drilling is also easier to achieve. Coulter pressure is simple to adjust, with four settings between minimum and maximum. The parallel linkage design ensures the optimum attack angle is always maintained. Drilling depth is adjusted by altering the position of the press wheel using the adjuster shown above, a choice of 9 positions are available. Spoked to reduce weight and close coupled to optimize drilling depth the press wheels ensure good seed soil contact for even emergence. Large diameter serrated disc's leave a well defined mark. 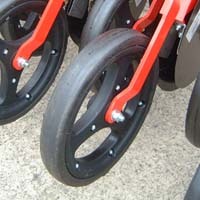 The angle of the disc can be adjusted to suit various conditions and wheel or centre marking can be set as preferred. A check valve eliminates the possibility of marker creep, the pivoting mount ensures that the marker is always in contact with the ground. As a solo drill the Ares is available in 4, 4.5, 4.8, 5, and 6m widths. Even in wider widths the compact design of this drill allows a low horsepower, lightweight tractor to be used. Resulting in reduced fuel usage and compaction whilst maintaining high daily work rates. Standard specification includes hydraulic drive fan. 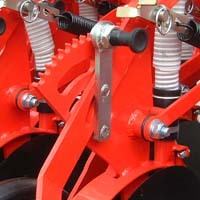 Here the cultivator is integrated into the drill design allowing the weight of the hopper contents to remain close to the tractor for reduced lift requirement. 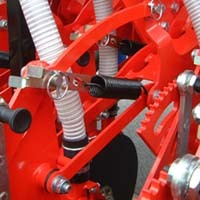 It features two rows of adjustable tines to provide initial loosening prior to sowing. Suitable for use in a wide range of conditions including heavy, wet soils and Min-Till incorporated seed beds.